The primary purpose of the University Archives is to document the history, growth and development of the university and to provide source material for administrators, faculty, staff, students, alumni and other members of the university community. While the archives holdings and services are developed primarily for the university, they are also available for use by visiting scholars and the general public. 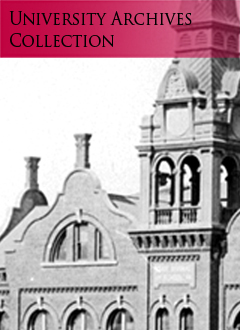 In addition to course catalogs, yearbooks, university publications, and works authored by faculty, the collection contains photographs, papers of the presidents and cabinets, department papers and many other resources. Finding aids to the collections as describes thus far are available in the Special Collections Department. New digital materials are being added to the University Archives digital collections.